Growing up in Vietnam, I enjoyed eating and sometimes just playing with the big bưởi that grew on and fell from trees in the yard near my friend’s house. But when I moved to Indonesia in my mid teens, I learned that bưởi are actually called jeruk Bali. Later, as a college student in the USA, I discovered that the English term for this fruit is pomelo, which is likely what was crossed with the mandarin or the tangerine, to make the orange, which my Dutch friends don’t refer to this same fruit by a color (i.e., orange) but by a place (i.e., China), and so the Hollanders call the fruit sinaasappel. But in North America the Chinese apple is the pomegranate, which is neither an apple really nor much of a pomelo. And the blood orange, which is not orange in color but is closer in color to the pomegranate is a mutation of the orange, likely. So how do we translate these terms from one language to another? What if “orange” in English doesn’t mean the color when referring to the fruit? What if “blood” in English doesn’t mean the body fluid that carries oxygen and nutrients to bones, brain, organs, and flesh and that washes away diseases and germs; what if it simply means the red color of such a fruit? What if translators are led astray by the same words with different referents and various absolutely undynamic, unequivalent meanings? What if they’re Bible translators? “Such words usually mean completely different things,” warns Joel Hoffman when noting how “How Similar Words Lead Bible Translators Astray.” The word “bank,” he says, in “river bank” is not the same word that’s in “money bank.” Nor, he goes on, does it help that “the ‘nuclear’ in ‘nuclear family’ and in ‘nuclear energy’ comes directly from the word ‘nucleus’.” And so we remember that the mandarin that one eats is not the Mandarin that one speaks. What I’d like to say late in this post is that there’s an alternative to Bible translators either being led astray by “similar [same] words” or not being led astray. When translators pay attention to culture, to insider plays on words, on words like “jeruk Bali,” then there’s no temptation to rob the words of their play in translation. Let me give an English text to translate and then a Dutch one. Let’s imagine translating the English to Vietnamese and the Dutch to Hebrew. Whether you know English well or Dutch at all (or Vietnamese or Hebrew), I think you can get what I mean. Notice how the author(s) call the fruit in English “pimplenose.” This is their alternative, funny word, for “pomelo.” Now how would you say any of that, plus “jeruk Bali” in Vietnamese? Would you call the three words all “bưởi”? They all are the same. They’re all the same just as “money” is the same for “money bank” and for “money bank.” But because, in English, the fruit is given different names, and because one is descriptive, as the Indonesian word is, then why shouldn’t the Vietnamese translation be as descriptive? Well, there’s no reason the Vietnamese language couldn’t handle these funny distinctions (i.e., “pimple” and “nose” and “jeruk” and “Bali”). In fact, if the translator just ignores the word play, the adjectival variations, well, it’s no longer a real translation of English and of Indonesian at all. The culture of metaphor gets lost. The Vietnamese reader or listener to just bưởi might “understand” clearly which fruit is being discussed, and yet all the peculiarities of the English fruit or the Indonesian fruit would be squeezed out. In de nabijheid der erven worden vele vruchtboomen aangekweekt. Zoo heeft men hier den mangga, den manggistan, de voedzame pisang, maar bovenal de pompelmoes (djeroek bësar), welke op Bali eene bijzondere grootte heeft en uitstekend van smaak is. Deze vrucht wordt als vorstelijk geschenk aangeboden en is dan tevens een teeken van vredelievende gezindheid. Ook de sirih behoort tot die planten waarmede de bevolking hare langage des fleurs spreekt. Zoowel mannen als vrouwen maken van de bladeren van deze klimplant gebruik en dragen die steeds in een zak welke boven den buikband om het lichaam gebonden is bij zich Bij het afleggen van bezoeken is het steeds gebruikelijk bij wijze van welkomstgroet de sirih aan te bieden Het is van alge meene bekendheid op welke wijze dit genotmiddel wordt gebruikt. De zoogenaamde pruim bestaat uit een sirih blad een weinig zuivere witte kalk en een stukje pinang noot of gambir. Als toegift en om den mond te reinigen wordt een kleine hoeveelheid fijngesneden tabak gebruikt. Gedurende het pruimen wordt het speeksel bloedrood welke kleur zich ook aan de lippen en het tandvleesch mededeelt. Vorsten en ho0ggeplaatste personen laten zich dan ook steeds een kwispedoor tëmpat loedah nadragen dat bij enkelen van goud d0ch bij de meesten van koper. I do want to show you now what I had early this morning for breakfast. 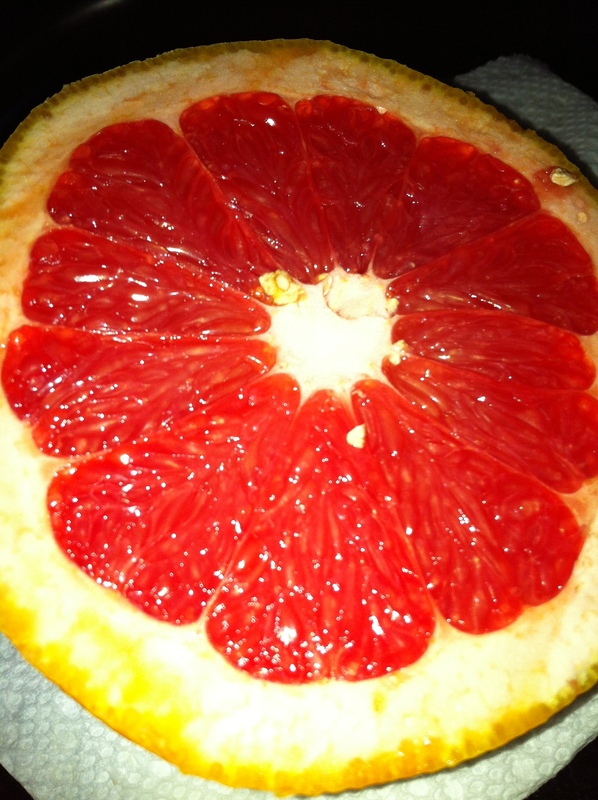 Here in Texas it’s a Texas ruby red grapefruit. There’s no need to worry the translator with the fact that it can still be a Texas citrus even in, say Minnesota or Hawaii or Maine or Oregon or Vietnam or China. Or that it’s not really a “ruby” or not precisely “red” all the time (my iPhone flash helped some); it’s actually orange on the outside though not an orange in size. Or not a grape though still fruit. The point is that “Texas ruby red grapefruits” are not “pompelmoes” either but may be something like them. And translators need not worry about teetering between the either / or of being led astray or not if they will get the culture, the distinctive naming peculiarities, the necessary wordplay among the culture of North Americans called Texans. And djeroek Bali are not bưởi or pomelos or pimplenoses. Jeruk Bali are Balinese Citrus.